This is the realest Whole Foods ever. Sometimes lessons in Street MMA begin in one venue and end up in the another. 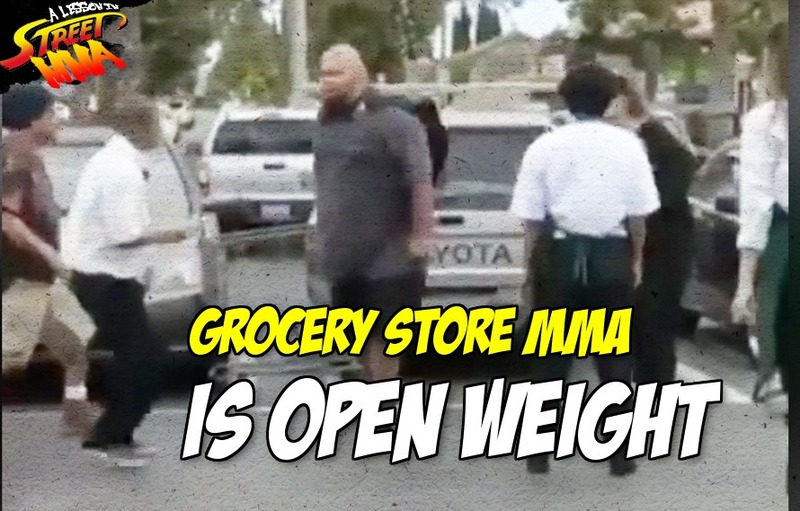 Here we have some form of Whole Foods, Street, Parking lot, random Grocery Store MMA hybrid bout. Our story begins with our villain and his lady friend stealing groceries. Like the Jane’s Addiction song, and accompanying music video, they were caught stealing. Instead of owning up to their crime, the super heavyweight who went for his five finger discount wants to throw hands. In Street MMA, all public disputes are solved by punching each other in the face. To prove your innocent just beat up on some teen grocery store workers. Only an innocent man would be willing to fight for his freedom. These are just facts. The fact that the people confronting him weigh 100 to 200 pounds less than him, surely have nothing to do with it. After packing away his stolen paper towels, pizza bagels and Cinnamon Toast Crunch into his getaway vehicle, our big dude goes looking for a fight. Backed into corner, this happens. The Big Kaboosh. It. Is. All. Over. Goodbye and goodnight, bang. Then our hero, who definitely wears a beanie 355-360 days out of the year, just bounces. One hitter quitter and then, peace he’s out. Never a good time at the local grocery store when you leave KO’d and in handcuffs. Don’t steal from this grocery store or some vigilante will uppercut knockout you into a car. Who was that guy?